Meyer Sound introduces 3 new 48-volt, DC-powered loudspeakers. RCF introduced its new line of 2-way speakers at NAMM, with 5 models with power ranging from 80W to 160W. Peavey announces the new SP BX Series loudspeaker enclosures. The SenSeries Speaker System consists of the Sense 8, Sense 12 and Sense 15 Speakers, along with the Sense 15B and Sense 18B Subwoofers. RCF presents two new series of monitors, the Compact Series and the Media Series. The Kinetic Series contains a lineup of passive full range enclosures supported by an 18” subwoofer and 2-way stage monitor. Gemini announces the new GTX series of passive loudspeakers. 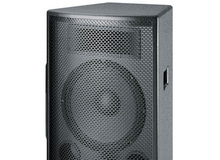 Electro-Voice launched its new EVU series of loudspeakers at InfoComm 2011. Launched at InfoComm 2011, the new LB3-PC passive loudspeakers from Bosch feature weatherized molded ABS enclosures for mobile or fixed indoor or outdoor use. Wharfedale Pro announced a new passive loudspeaker range targeted at the touring and fixed installation sector.